President Trump is being criticized after refusing to join other presidents at former President George H.W. Bush’s funeral on Wednesday as they read the Apostles’ Creed. Trump, who received the support of more than 80% of white evangelical and born-again Christians in the 2016 presidential election, is drawing pushback from critics online after refusing to join his fellow living American presidents to recite the Apostles’ Creed at former President George H.W. Bush’s funeral. In contrast with leaders seated around them, President Trump and first lady Melania Trump did not recite the Apostles’ Creed — a common statement in Christianity — at the Washington, D.C. funeral for late President George H.W. Bush on Wednesday. There are people who will find an excuse for why Trump could not simply look at the program and read the Apostles’ Creed who would have called Obama the anti-Christ if he had stood there silently like this. 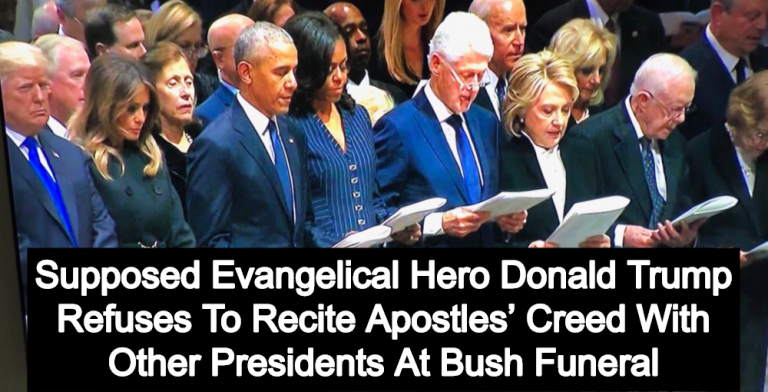 Interesting moment — Trump and Melania don’t utter the Apostles’ Creed, while the other former presidents and former first ladies in the front row read it from their pamphlets.